Professional contractors, carpenters, handymen and extreme DIYers understand the importance and indispensability of an oscillating tool. It is a lightweight and compact machine that enables the user to take on a wide array of projects both around the house and on the job site. The oscillating tool, for instance, is an ideal choice for sanding, pounding, sawing, and cutting, among several other functions. They have a typically small front-end profile and blades that stretch beyond the end of the product and is therefore ideal for reaching tight and hard-to-reach spots that are normally inaccessible to standard-size tools. Aside from their lightweight and small profile and versatility, the preference for oscillating tools is also informed by their ease of use, effectiveness, cost-effectiveness, longevity and most importantly, superior and reliable high-performance. When you start combing the Internet for the best or more accurately the most suitable oscillating tools, they suddenly appear ubiquitous, which, for greenhorns, considerably complicates the process of finding one. Separating the wheat from the chaff is a rather complex, time-consuming, energy-draining, and tasking process. Without proper guidance, it might take several weeks and today’s hectic life leaves you little time, or effort, to start the search from scratch. With this in mind, we’ve taken it upon ourselves to put together a list of the best oscillating tools optimized for undertaking a wide range of projects including but not limited to sanding, sawing, cutting, grouting, and even scraping. To compile the list, we had to take several factors into consideration including convenience and performance features, versatility, ease of use, and practicality. If you’re looking for a versatile, affordable, high-performance, long-lasting, and easy-to-use oscillating tool to add to your growing collection of indispensable tools, look no further than the DeWalt DCS355D1. The incredible versatility of the oscillating tool is further aided by its compatibility with a wide array of accessories or attachments, 29 to be specific. The DeWalt DCS355D1 also packs a broad range of performance and convenience features that take the effort and time away from an otherwise energy-draining, tedious, and time-consuming task. And the best part is that in spite of its mind-blowing performance, versatility, and ease of use, the oscillating tool features a surprisingly pocket-friendly price tag. It has a laundry list of signature features, but none is quite as captivating as its performance. The machine packs an incredibly powerful and long-lasting and reliably working 3.0 amp motor that enables you to cut three different materials and objects like you were cutting through a piece of cake with a hot knife. The phrase is a cliché, but it accurately describes the mind-blowing performance of the oscillating tool. The icing on the cake is the motor's incorporation of brushless technology. The brushless motor has several advantages over the standard brushed motor. For instance, the brushless motor significantly reduces friction during cutting, which makes for a quieter and smoother experience. It also prolongs the shelf life of the machine by up to 57 percent longer, according to DeWalt. To further expound on the versatility point made in the introductory paragraph, it is compatible with up to 29 different attachments. Given the sheer number of attachments the oscillating tool accepts, you might be understandably concerned about the effort it'll take to change one accessory for another. 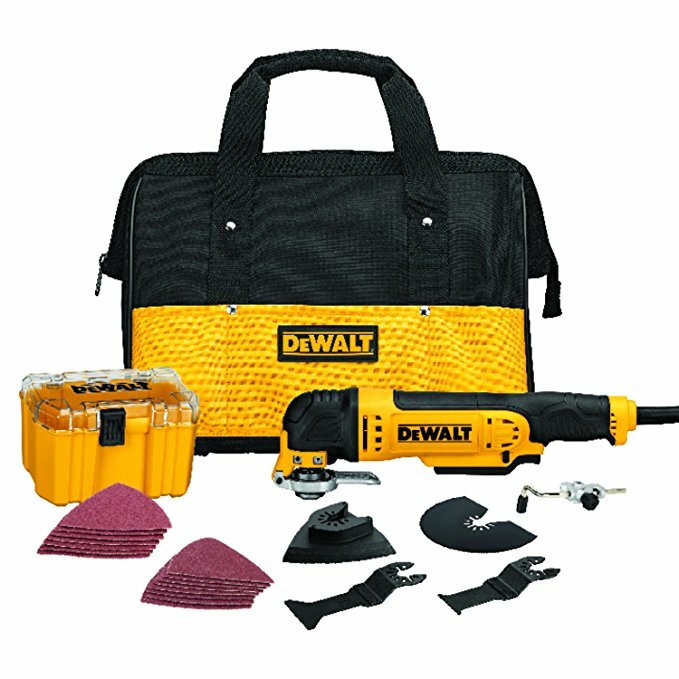 However, DeWalt is a firmly established brand with the wherewithal and dedication to make their product a cinch to use. In the case of this model, there is a Quick-Change System that allows you to change quite effortless and quickly from one accessory to another. And the beauty of the process, aside from the ease and speed of it, is that you don't have to use any specially designed tools like wrenches and the like to get the job done. The sheer number of attachments it accepts means you can undertake any project either on a domestic or commercial scale without investing in additional tools. Also, before we forget, the oscillating tool also has a Multi-Brand Accessory Adaptor that makes the kit compatible with other manufacturer's accessories. The oscillating tool is very lightweight and compact, weighing a paltry 3.22 pounds and with a length of 12.20 inches. Additionally, the oscillating tool is capable of oscillating at an angle of 1.6-degrees while maintaining full speeds of 20,000 oscillations per minute. Combine the small and lightweight design and the impressive oscillating angle, and you have a machine that easily and quickly gives you full access to tight and hard-to-reach spaces around the workshop. To this add the fact that it comes with a bright and long-lasting LED light to ensure your productivity does not suffer when you work in areas where the lighting conditions are less than ideal. In the same breath, the oscillating tool has an ergonomically design handle that increases comfort and ease of using it. The DeWalt DCS355D1 is a battery-powered oscillating tool. It uses the all-powerful and long-lasting 20V MAX XR 2.0 Ah battery. The first advantage that comes with the design is portability. Unlike its electric counterparts, you don't have to lug a heavy power cord behind you every time, which can be particularly problematic if you don't have the upper strength or the patience. Secondly, the oscillating tool is remarkably portable as there is no power cord to limit your movement. Couple this with the lightweight and compact design, the ergonomic design, the versatile variable speed feature and ease of use and you can spend the whole day quietly, effortless and quickly working away on different materials and objects around the workshop. Both skeptics and admirers of this tool agree on one thing: the oscillating tool provides reliability and consistency in performance. It is an ideal machine for all your domestic and industrial-grade projects and because of its modest and simple design, using it is a cinch. The Rockwell RK5151K comes with all the flair or bells enthusiastic Do-It-Yourselfers and professionals look for in oscillating tools. Just to give you a quick overview, the oscillating tool, like our first pick, comes with a Universal Accessory Interface that ensures compatibility of the machine’s parts with those from other brands. Changing blades and the various attachments is similarly straightforward and quick, thanks to the Rockwell Universal Fit System. There is also a convenient LED light and lastly a powerful motor for effortless, efficient and quick grouting, sanding, detail-sanding, and cutting of different objects and materials. The machine packs a powerful and heavy-duty 4.2-Amp motor. In layman's terms, the motor packs more than enough power for the tasks you may have at hand and enables you to wrap up your project in just a fraction of the time it takes less efficient and powerful models out there. The oscillating tool also provides the user with quick and trouble-free performance, and is highly customizable, thanks to its variable speed feature. You can choose any speeds between 10,000 and 19,000 oscillations per minute depending on the type of material you intend to work on. 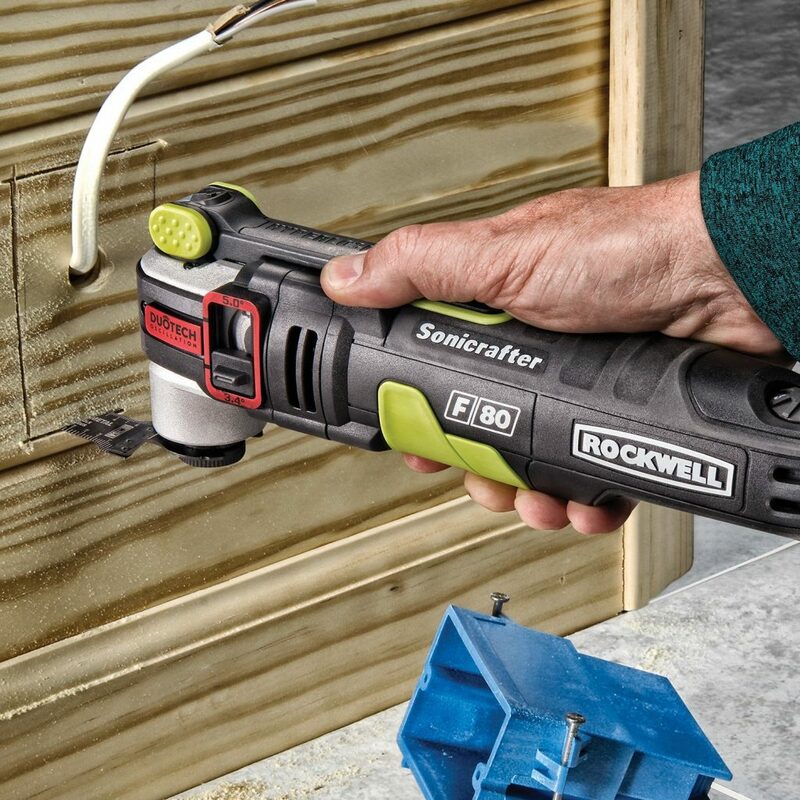 Irrespective of the ruggedness or thickness of your cutting piece, the Rockwell RK5151K packs up to 35 pounds of force that makes short and quick work of the toughest materials in your workshop. The design and engineering also aim to keep you safe and in workpiece al throughout your project. The machine, for instance, exerts up to 1 ton of clamping force on the blade to ensure it does not slip at any time during work. Similarly, the oscillating tool comes with a 5-degree and 3.4-degree Duotech Oscillation feature for effortlessly switching angles, which allows you to choose and achieve the type of cut you want, whether it is quick or well-controlled. For quick and aggressive cutting, the 5-degree angle comes highly recommended while the 3.4-degree cutting angle is optimized for slow and precise cutting action. Additional versatility comes from the machine's Accessory-Securing System that makes attaching and using blades from other oscillating tools manufacturers quick and hassle-free. 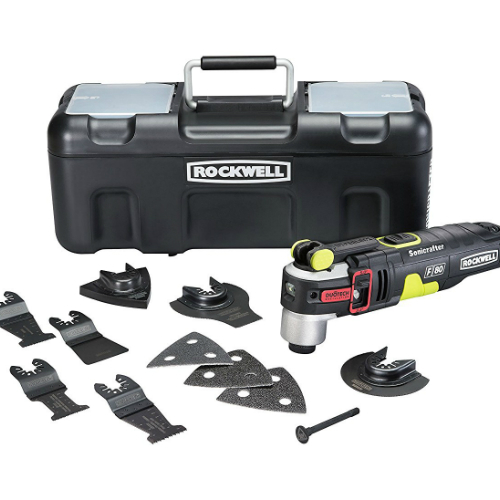 The design, therefore, does not limit you to only those blades and accessories from Rockwell. Essentially, it is a jack of all trades, and can efficiently complete a wide range of projects including but not limited to cross-cutting, plunge cutting, uninstalling old layers of paint, grouting, and sanding. The Rockwell RK5151K is both lightweight and compact and the possibility of it straining your hands or causing hand fatigue within the first few minutes of using it are minimal at best. With a weight of just 3.3 pounds and dimensions of 11.6 inches by 3.5 inches by 4 inches and an ergonomic design, it fits perfectly in the hand. However, the oscillating tool is electric, which inevitably means it comes with a power cord that you’ll have to contend with as you do your craft. It has a length of 10 feet and therefore will limit your movements to a 10 feet radius. This tool has an overwhelming list of innovative features. Other than the industry standard lightweight and compact design and high-performance, thanks to its powerful 4.2-Amp motor, the oscillating tool also offers the user two angles for greater versatility. Changing blades, even with those from competing brands, takes little effort and time. The oscillating tool's impressive cutting load of up to 35 pounds of force and its heavy-duty construction enable you to take on the toughest projects around the workshop confidently. Porter-Cable is a household name and therefore needs no introduction at all unless you're a greenhorn hearing about it for the first time. In that case, we won't waste a minute informing you that it's yet another industry leader that has been manufacturing high-end, performance-driven power tools and accessories for more than a century now. 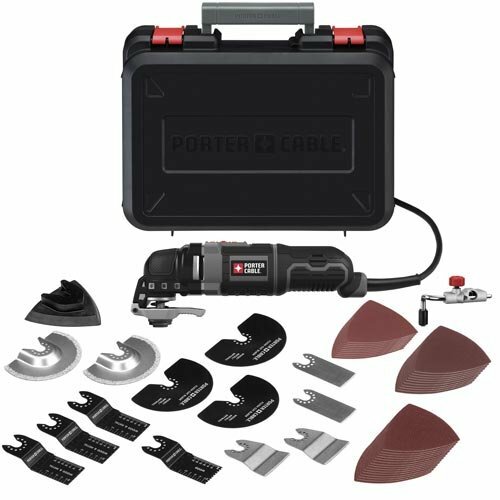 No power tool is a better demonstration of Porter-Cable's vast experience and skill in manufacturing high-performance, long-lasting, easy-to-use and affordable tools like the Porter-Cable PCE605K52 does. Every nook and cranny of the oscillating tool reeks of professional construction and superior performance, which does little to belie its otherwise humdrum, simplistic outward appearance. Some of its most outstanding fortes include superior performance, flexibility, fastidious and rugged construction, and affordability. Performance-wise, the Porter-Cable PCE605K52 is one of the best oscillating tools you can find on the market right now. It comes with the industry standard variable speed feature that makes it a versatile tool. The feature allows you to easily match the speed to the toughness or softness of the material you intend to ground, sand, scrape or cut. The speed ranges widely between a low of 10,000 oscillations per minute to a high of 22,000 oscillations per minute. And the best part is that the oscillating tool comes with a simple and easy-to-use dial for choosing between the different six speeds settings. Its spectacular performance is aided by its powerful 3-Amp, 120-Volt motor that also boasts a decent 2.8-degree oscillating angle. The oscillation angle does not hold a candle to those of the first two oscillating tools. However, the machine makes up for the downside by offering the user a superior tight cut that’s controllable with lots of ease, thus ensuring precision. And to guarantee that the user makes to errors while cutting, grouting, or sanding, the sturdy frame dampens most of the resultant vibrations, providing for a quiet and smooth operation irrespective of the nature of the material you’re working on. Aside from the vibration-free performance, it also has several other convenience features that aim to make your work easy and fun. The grip, for instance, features an ergonomic design with a 3-position overmold to increase comfort and ease of use. You can change the position to a level you find most comfortable. The risk of hand strain or fatigue is non-existent, which makes it a great tool for those users thinking of plying their craft for hours on end. Like the first two oscillating tools, the Porter-Cable PCE605K52 also provides for quick and effortless changing of blades and other accessories without the user having to use wrenches and bolts. Similarly, the user can adjust the depth of the cuts in an easy and fast manner by using the provided detachable depth guide. The feature is beneficial as it gives the user additional control and allows them to finish plunge and cutting projects quickly. Like the previous oscillating tool, it is an electricity-powered model, a design that comes with its attendant upsides and downsides. To begin with the advantages, you don’t have to worry about the battery running out any time soon or have to go through the hassle of carrying an extra battery pack. On the flip side, the oscillating tool has a 10-foot power cord which, in spite of the impressive length, will still hinder free movement and will occasionally get entangled between different objects in the workshop, which can be frustrating. But it's not all gloom. The Porter-Cable PCE605K52 is lightweight and compact and won't strain your body or hands during work. Last but not least, it features high-quality construction. The manufacturer's use of rugged, high-quality materials means that it gracefully withstands the rigorous and demanding task of cutting, grouting, and sanding without any considerable wear or tear. The high-end construction also means there will be no scraping or bumping if it drops inevitably on hard surfaces. 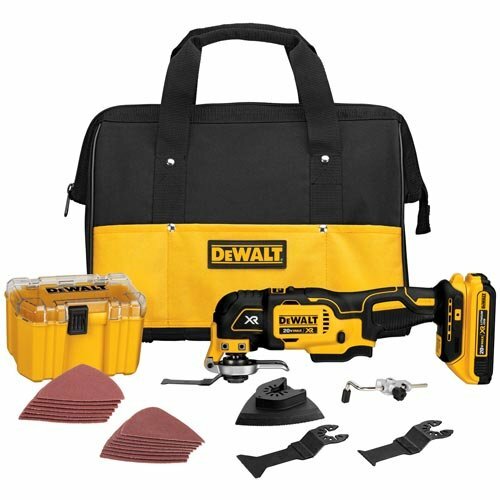 The DeWalt DWE315K is the second DeWalt product to make the list, a fact that speaks volumes regarding the construction quality and performance of these products. Like its previous brother, this oscillating tool offers incredible usefulness and versatility, allowing the user to take on a multitude of workshop projects. To quickly enumerate the outstanding features before diving into an in-depth review, the oscillating tool sports a brushless motor, height and depth adjusting feature for more accurate cutting, and a useful LED light for convenience. The tool is corded so it runs endlessly, has the requisite versatility and power to confidently and quickly take on the most challenging and demanding tasks around the house, allowing the user to finish quickly and precisely. Like all other high-end DeWalt oscillating tools, it features the innovative, energy-efficient and a long-lasting motor capable of delivering an additional 57 percent more runtime compared to the standard brushed motors in cheap, off-brand oscillating tools. In addition to longevity, the brushless motor offers the user a smooth and generally quieter cutting experience devoid of inconveniencing and energy-draining vibrations and is less prone to overheating. Concerning performance, it truly amazes. It boasts an oscillating angle of 1.6 degrees with speeds ranging between 0 and 22,000 oscillations per minute. To this add the variable speed feature that allows you to customize its speed to the task you intend to undertake. The patented Quick-Change Accessory System is yet another auxiliary feature that strikes a chord with the vast majority of contractors, handymen and enthusiastic DIYers in need of flawless, efficient, and trouble-free performance. With the feature, you can quickly install and uninstall the oscillating tool’s accessories, including blades and other attachments, without having to use any wrenches. And to sweeten the deal further, the accessory kit contains 29 different accessories including some of the commonly used attachments for cutting and sanding different objects and materials. Additionally, like most oscillating tools, it has a universal accessory adapter to ensure compatibility with accessories and attachments from other competing brands, making the oscillating tool even more versatile. Using it does not take much effort seeing as it is awash with several convenience features. At 3.1 pounds and a length of 12.20 inches, it is a lightweight and compact oscillating tool that you can easily wield with one hand. The manageable weight and ergonomic design prevents any occasions of hand fatigue or strain and instead enhance comfortability and manoeuvrability. And because of the compactness, the oscillating tool allows you unhindered access to tight and hard-to-reach spots around the workshop or house. It comes with a dual-grip variable-speed trigger for effortlessly and conveniently controlling the speed of the machine. The dual-grip allows for a two-handed operation that aims to increase precision when cutting or sawing. To top it all off, it comes with a useful LED light placed strategically at the front for illuminating your cutting material in case you work late into the night when the lighting conditions are less than ideal. Overall, the performance, usability, practicality, and cost-effectiveness of this option makes the go-to oscillating tool all over the world. If you want a tool that can handle all the tough and complex projects, the DeWalt DWE315K should easily come at the top of your list. Only a handful of oscillating tools have it all or offer the user the best of all worlds including performance, versatility, use of use and cost-effectiveness. And in the off chance that they do, more often than not they'll have a staggering price tag, with the notable exception of Bosch StarlockPlus. The oscillating tool is one of the few machines on the market that perfectly balance performance, versatility, power, and convenience. 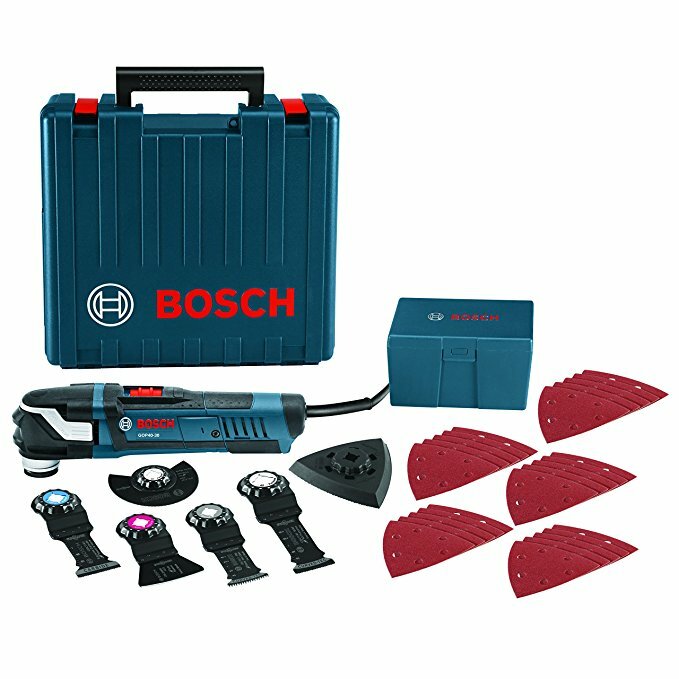 The fact that the oscillating tool packs several convenience and performance-enhancing features do not come as a surprise at all to anyone familiar with Bosch. The company is a household name and enjoy a great reputation for continually manufacturing top-notch power tools. This is a heavy-duty oscillating tool that's clearly cut out for equally heavy-duty applications both around the house and on the job site. The machine runs on a powerful and high-performance 4.0-Amp motor that provides a constant and reliable response. The industry-best speeds of up to 20,000 oscillations per minute and the impressive 3-degree oscillating arc or angle make it an all-time favorite of users all over the world. And the best part is that it offers the user a variable-speed feature, giving the user total discretion over speed settings that they can easily match to the tasks at hand. Another signature feature that prevents overloading and the subsequent overheating is the Constant Response Circuitry system that ensures the speeds never exceed the levels the user sets. It also features a robust and rugged construction quality that’s commensurate with the rigors of cutting, sanding, sawing, and grouting, among other applications. The use of high-quality materials, for instance, considerably extends the machine’s lifespan and prevents it from bumping or denting in case it inadvertently falls on a hard surface; the tough frame easily withstands the high impact. In keeping with its high-end construction quality, the oscillating tool also features reinforced gearing that significantly increases longevity while minimizing any excessive vibrations that might compromise precision while cutting. In the same breath, the reinforced gearing guarantees optimal force transmission, making for quick, efficient and effortless use. In spite of the construction using high-end and durable materials, it is still lightweight and compact, so the user does not have to expend too much energy and time on a project. The oscillating tool weighs a paltry 3.3 pounds and has dimensions of 11 inches by 2.5 inches by 3.8 inches. The lightweight and small profile allows for quicker and more natural maneuverability, and provide for quick and easy access to the tight and hard-to-reach spots. To this add the oscillating tool's ergonomic grip zones. Since they have soft rubberized overmold, they provide a lot more comfort and ensure ease of use. The chances of suffering hand fatigue or straining your fingers are very remote at best, meaning that even the elderly members can use it with peace of mind, confidently and for several hours on end. And speaking of extended use, the oscillating tool, like most top-end variants on the market, comes with a useful LED light for illuminating your work when working in dimly lit spaces. The feature effectively eliminates the frustration of carrying your own lighting solution and balancing between working with one hand and holding it with the other. It aims to take the time and effort away from any application you may undertake. Switching from say, sanding to grouting, for instance, will inevitably require changing blades, which is a traditionally time-consuming process that requires one uses a wrench or a specially designed tool. That’s not the case with this oscillating tool, thanks to its snap-in tool-less accessory attachment and release lever. The feature lets you change from one accessory to the next quickly and without using any tools. Removing the blade, for instance, is as easy as pulling the release lever, saving you the trouble of using wrenches. The quiet and efficient operation of the Bosch StarlockPlus completely belies its remarkable performance. It packs a powerful and reliable 4.0-amp motor that's ideal for quickly and effortlessly completing the toughest jobs on the site. The delivery package comes with up to 32 accessories, way more than enough. Changing between different accessories is relatively easy and quick as the oscillating tool features the time-saving and convenient. With variable adjustable speeds of up to 20,000 oscillations per minute and a 3-degree oscillating arc, an LED light, and ergonomic grips, it's one of the best oscillating tools on the market currently. Homeowners and professionals in need of a handy oscillating tool for quickly and easily completing a wide range of applications around the house should take a keener look at the Genesis GMT15A. It should be your go-to tool when you intend to repair, remodel, and restore your home. Because it is lightweight and compact, it easily reaches tight and hard-to-reach spaces, which makes it a perfect choice for projects like close-quarters sawing. The use of industrial-grade aluminum for the construction means it has adequate ruggedness to withstand various tough tasks. Still, it is amazingly lightweight and compact and very easy to use. Plus, it comes with a ridiculously budget-friendly price tag of less than $40. The Genesis GMT15A is an entry level oscillating tool, so its performance is not comparable to other high-end models. Still, its performance more than meets the everyday demands of most handymen, carpenters, contractors and other professionals. It packs a relatively powerful 1.5-Amp motor that effortlessly delivers speeds of up to 21,000 oscillations per minute. While it might not go through different materials with the efficiency and speed of its more powerful counterparts, it still provides for a relatively effortless experience. Couple the powerful motor with the product’s innovative oscillating head and you have a product that makes short and quick work of tasks that would otherwise considerable time and effort investment. The tool comes with a deceptively cheap price tag that might easily be construed to mean inferior performance or a brief lifespan. However, the performance and use of using the oscillating tool closely rivals that of pricey models. For instance, it features an all-die cast aluminum gear housing, a feature that conspicuously lacks in most oscillating tools. The oscillating tool also has a game-changing and performance-enhancing 4-pin flange design that guarantees all the accessories you install, irrespective of their use and size, stay firmly in position for the entire duration of your project. It's also a versatile machine and a perfect choice for those looking to undertake a wide range of projects. It comes with a few commonly used blades to make it easy to change from one task to another. The 30-mm flush cutting saw blade, for instance, is perfect for making precise cuts along edges and in hard-to-reach corners. With the blade, trimming narrow door jambs or base molding is an insanely easy task. There is also a 3-inch flat saw blade for cutting out woods, plastics, and even drywall. Without a doubt, the GMT15A is easy to use, and the manufacturer takes great care to simply its design as much as possible, so there are no hiccups during use. The oscillating tool is both lightweight and compact and works smoothly and efficiently. Aside from increasing its useful life, die-cast aluminum used in the construction also dissipates most the heat generated during construction and dampens vibrations. The weight comes to just 2.75 pounds, and the dimensions stand at 12.4 inches by 5 inches by 4.5 inches. You also get a generous 24-month warranty to complement the high-quality construction. You might never have to use it, though, as the Genesis GMT15A is a fastidiously constructed oscillating tool that will withstand the test of time. If your heart is set on acquiring an oscillating tool offering nothing short of remarkable performance and versatility, take another look at this option. The powerful 1.5-Amp motor is capable of impressive speeds of 21,000 oscillations per minute. The formidable die-cast aluminum construction prolongs its useful life and dissipates most of the heat, besides dampening the attendant vibrations, leaving you with a hassle-free, efficient, and quiet operation. 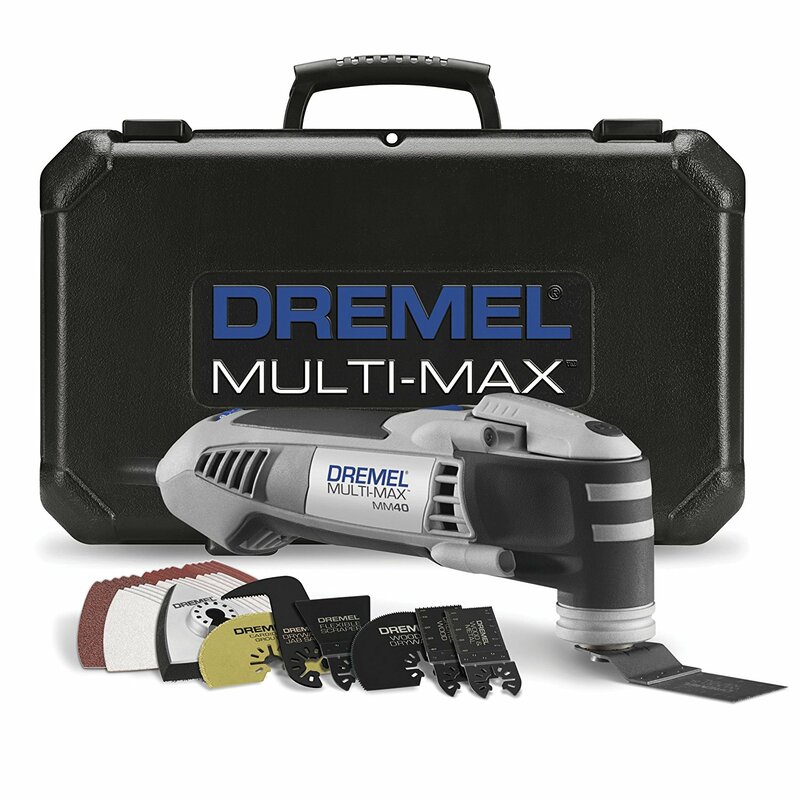 The Dremel MM40-05 Multi-Max Kit aims at meeting most requirements of all segments of the market. Its high-end construction quality enables the user to take on tough and heavy-duty projects both around the house and on the job site. Consequently, it would be at home both in the toolbox of an enthusiastic DIYer or that of a professional. Like most other oscillating tools, the Dremel MM40-05 is perfect for a wide range of projects. 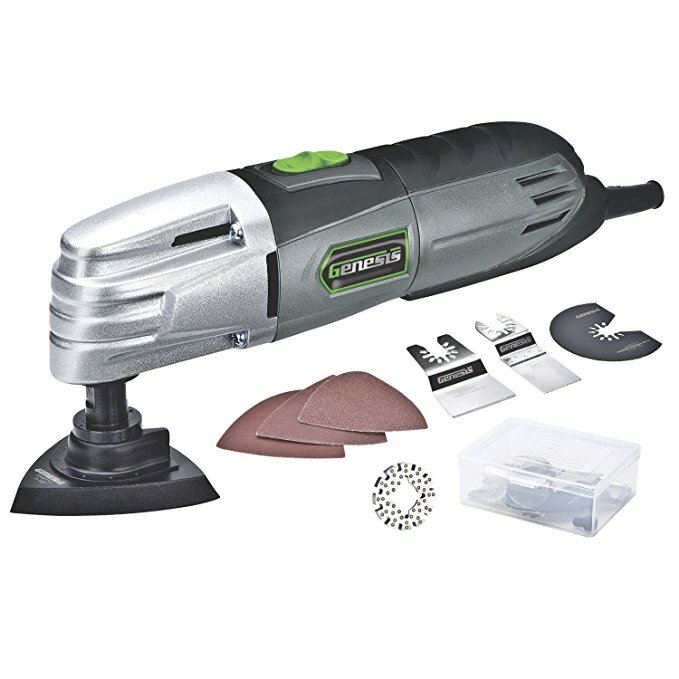 For greenhorns looking for a powerful oscillating tool for completing a plethora of applications around the house and for gaining some useful experience before upgrading to more powerful models, the MM40-05 more than suffices. It has a high-performance 3.8-Amp motor that supplies enough power for tackling the toughest and most demanding applications around the house and on small-sized workshops. The delivery package comes with a wide range of blades for tackling different types of jobs. You get four different types of cutting blades, a grout removal blade, and several sanding accessories, all of which eliminate the hassle of buying these separates from local or online stores at high prices. It is capable of impressive speeds. The powerful 3.8-Amp motor allows it to easily reach maximum speeds of 21000 oscillations per minute and a low of 10,000 oscillations per minute. Also, there is the variable speed feature that lets the user customize the speeds in accordance to the task they want to undertake, ensuring the complete the project not only with ease but also with military-grade precision. The quick-boost feature guarantees that it maintains constant speeds all throughout the project, irrespective of the toughness or ruggedness of your applications and materials. To the high-performance motor, add a versatile 3.2 oscillating angle. These two features pair nicely with the product's compatibility with 36 different accessories all of which you can cycle through quickly and with minimal effort, thanks to the machine's quick-lock that conveniently eliminates the need for using any additional tools like wrenches or specially designed tools. There is also a quick-hold feature that uses magnetic flange for holding the different accessories firmly and securely in place to further make it easy and quick to change from one accessory to another. Among other things, the quick-hold feature minimizes the likelihood of tool slippage while enhancing stability. However, unlike top-of-the-line oscillating tools like DeWalt and Bosch, the MM40-05 does not come with any adapters to make it compatible with parts and accessories from its competing brands. You're therefore limited to using only those from Dremel. At 4.5 pounds and dimensions of 17.2 inches by 4.2 inches by 10.5 inches, it is relatively lightweight and compact. It should not present the user with any serious problems regarding usability. The dimensions spare the user the hassle of bearing excessive weight on their hands that could easily trigger hand fatigue and strain. In the same breath, the physical attributes make it an ideal choice for quickly and easily accessing hard to reach spaces. There is also a useful 24-month limited warranty that caters for any defects or malfunctions resulting from the manufacturer's use of low-quality or defective materials or a shoddy manufacturing process, none of which is ever the case with Dremel. In addition to perfectly balancing performance with affordability, the oscillating tool is also very sturdy in its construction quality and is remarkably easy to use. Plus, it comes with an up-front on/off switch that makes it ideal for one-handed operation. At its price range, it is by far one of the best oscillating tools money can buy. While this oscillating tool packs all these time and energy-saving features and specs, it is surprisingly easy to use and cost-effective, which means you don’t have to, or think of, breaking into a bank to afford one. 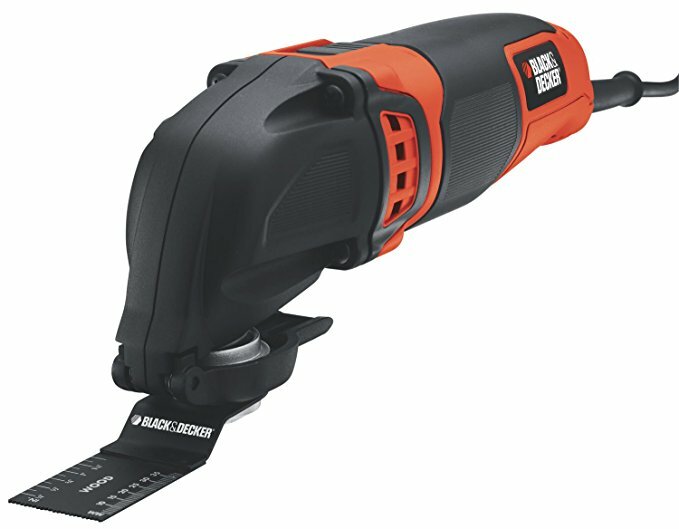 The Black & Decker BD200MTB packs a relatively powerful and high-performance 2.5-Amp motor. The direct implication of the fact is that it can provide for effortless and pain-free scraping, sawing, cutting, sanding, and grouting. The immense power easily allows the oscillating tool to reach maximum speeds of 20,000 oscillation per minute. To this add the machine's accompanying variable speed feature with up to six different speed settings. The design makes it a highly customizable or tuneable oscillating tool on the market. Higher speeds are ideal for more demanding tasks or those that would otherwise take more time and energy. Its professional design and engineering aims and succeeds at making your work easy, quick and even fun with a bunch of several useful features. First, the oscillating tool is lightweight and compact, meaning that maneuvring and controlling it don’t require as much energy. There are no risks of hand fatigue or strain or joint pains, as most heavy, bulky models tend to do. The small profile of course also helps with accessing tight and hard-to-reach spaces, both around the house and on the worksite. Closely related to the lightweight and compact design point is the ease of use. The BD200MTB comes with ergonomically designed handles with comfortable grips so that controllability and handling are never a problem, which is important if you're handling a delicate project where a small mistake would be costly. You, therefore, attain high-quality or the most accurate results with the project you're undertaking. As for versatility, it's an ideal oscillating tool for undertaking a wide range of projects. It comes with 13 different accessories to dramatically expand your working horizons and capabilities. The tool-free release mechanism, coupled with the Quick-Release feature, for instance, enable you to quickly and easily change accessories without having to use a wrench and without the need for a traditional tool such as a hex key. The Black & Decker BD200MTB is a solid choice for contractors and homeowners who want a taste of high-end features but at a fraction of the premium price tag. The remarkable 2.5-amp motor provides enough powering through the toughest projects. It’s highly customizable and easy to use, thanks to its comfort grip and minimal vibrations. Swapping out accessories for newer ones has never been with the tool-free blade release feature that coupled with its 13 available accessories, allow you to jump easily from one task to another. Plus, it comes with a sufficiently long 24-month warranty to cater for any defects and malfunctions that might result from the manufacturer’s use of low-quality materials. We guarantee it; you’ll never regret the decision to buy this option. 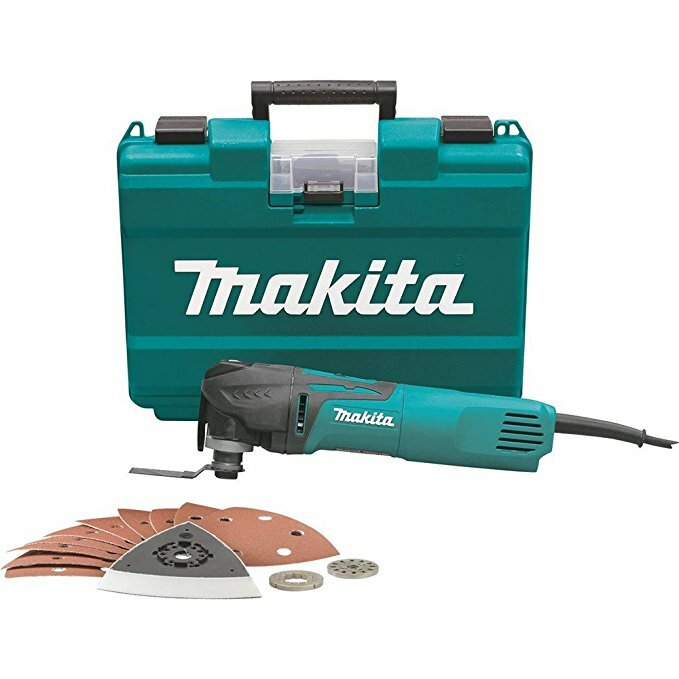 Makita is without a doubt a definite name in the power tools industry, renowned for churning out consistently remarkable and high-performance power tools. One of their flagship products, the Makita TM3010CX1 has all the bells and whistles to make for quick, effortless, and efficient work, just like other oscillating tools higher on the line. Despite being lightweight and compact, the oscillating tool features a remarkably sturdy and rugged construction. The direct implication is that you can use it to complete a wide range of projects both domestically and on a commercial-scale including but not limited to removal of grout, scraping, sanding, and cutting. The TM3010CX1 Multi-Tool is also a cinch to use, with a paltry weight of less than 4 pounds and a small profile. Coupled with its ergonomic design, it is a solid choice for users looking to undertake heavy-duty applications for prolonged periods comfortably and with ease. Performance is one of the fortes of the Makita TM3010CX1. Its sturdy, durable casing houses a powerful 3.0-Amp motor that works smoothly, flawlessly, and quietly even after several hours of consistent use. And while it is not brushless, it provides for significantly long runtime without heating up, as is the case with cheap, off-brand motors. The high-performance motor provides speeds of up to 20,000 oscillations per minute, meaning that you’ll be done with the job in a fraction of the time it takes less powerful oscillating tools out there. The design enables the user to achieve the best results and maintain superior accuracy by offering a variable speed control dial. The feature makes the oscillating tool very versatile as it enables you to attain and maintain any speeds within a range of 6000 to 20000 oscillations per minute. As a result, it is possible for you to choose a speed that best matches the project or material you’re working with. By using the electronic speed control, you won’t experience the slightest hiccup maintaining constant speed under load, thereby making for smooth, high-grade work. To the versatility and industry-best performance add a soft start feature that guarantees hassle-free start-ups and enhanced performance all year long. Still, on versatility, it comes with a wide assortment of accessories and blades to allow the user switch with ease from one project to another. Wide the collection is not as comprehensive or as wide as those offered by other oscillating tools, it nonetheless contains all the commonly used blades. And the best part is that you don't have to use any tools like wrenches to change from accessory to another. Additionally, it's compatible with accessories from competing brands and comes with a clamp system with several tightening settings to securely and firmly hold the accessories to guard against them falling off in the middle of an operation. True to its high-performance reputation, the TM3010CX1 just never runs out of innovative, time-saving features. In addition to being lightweight and compact, the oscillating tool also has a 3.2-degree oscillating angle that makes for quick, effortless and hassle-free operation. You can access tight and hard-to-reach spots with the oscillating more easily than you would with bulkier, heavier tools. The heavy-duty frame dampens most of the resultant vibrations which, coupled with the near-quiet running of the motor, make it using the oscillating tool quite a joy. The ergonomically designed barrel grip provides for comfortable and secure holding and handling. To this add the easy-to-reach and strategically positioned on/off slide switch with a lock-on button for the convenience of the user. As far as ease of use goes, the oscillating tool is without a doubt one of the best ones on our list and the market. The icing on the cake is the cost-effectiveness which is surprising as it easily reaches speeds of up to 20,000 oscillations per minute and has a variable, 5-speed dial. Couple these with its compatibility with accessories from different manufacturers and you have a valuable tool for undertaking a wide range of projects around the workshop. Constant exposure to the ear-splitting noise that cheap, off-brand oscillating tools produce can lead to gradual deterioration of one’s hearing sensitivity. The attendant vibrations, on the other hand, cause hand exhaustion and strain and can affect one’s general health and well-being. It’s against this background that our 10th pick is the high-performance, cost-effective, and long-lasting Fein FMM350QSL. The machine works quietly and with minimum vibrations, making it an ideal companion for extended use in and outside the workshop. Jumping from one task to another with the FMM350QSL is, of course, easy as it also features a time-saving and convenient tool-free accessory change mechanism. 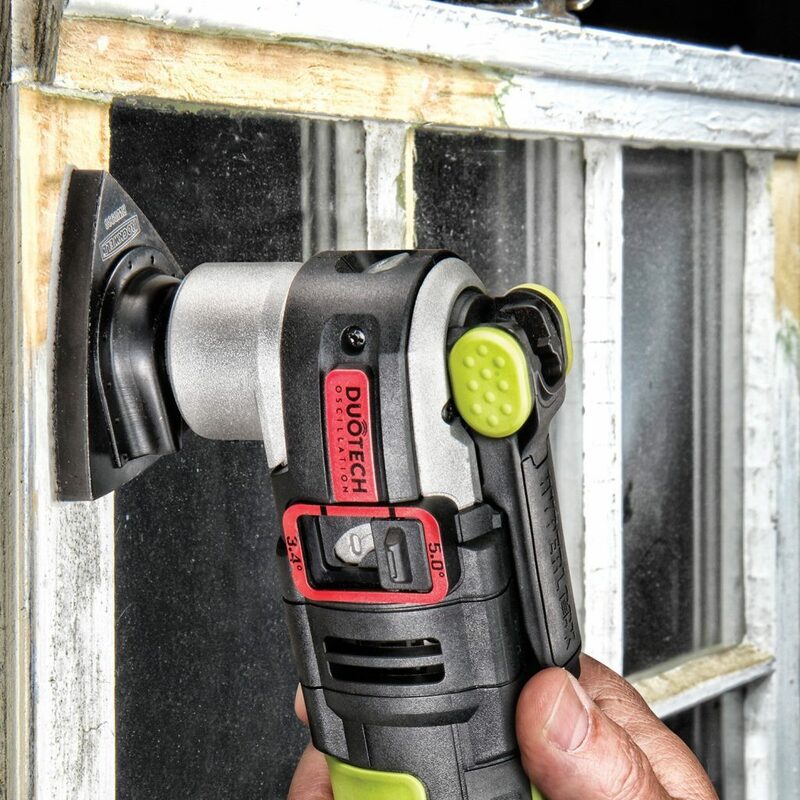 These, and several more features and specs make it the go-to tool for the vast majority of contractors, handymen, repairers, carpenters and even extreme DIYers from around the world. The fact that it comes last on our list of best oscillating tools should be construed to mean its performance, longevity, usability, and proactivity can't stack up against those of high-end models on the market. The powerful, quiet, and near vibration-less operation of the oscillating is wholly attributable to the 350 Watt motor with high copper content and the independent tool housing. The oscillating tool also gets to maintain a consistent speed while operating under load, thanks to the incorporation of an electronic speed control feature. The inclusion of high-end ball bearings and the complete separation between the MultiMaster housing and the high-performance motor significantly dampens the vibrations by up to 70 percent and noise by some 50 percent. It, therefore, operates more quietly and flawlessly. As a matter of fact, the sturdy construction using high-end, high-quality and durable materials means it can gracefully withstand the toughest working conditions. Operating and handling it is one of the easiest things you can do as it provides the user with a simple and straightforward operation. It weighs up to 4 pounds and is lightweight and compact, and the even weight distribution provides for easy maneuverability and control, especially when you have to access tight and hard-to-reach spots and spaces. Like the previous oscillating tool, the grip features a soft, rubberized grip that enhances comfort and ease of use for those prolonged, demanding and time-consuming projects. The small and lightweight profile pairs nicely with the product's 16-foot heavy-duty power cable that significantly increases your reachability and portability. 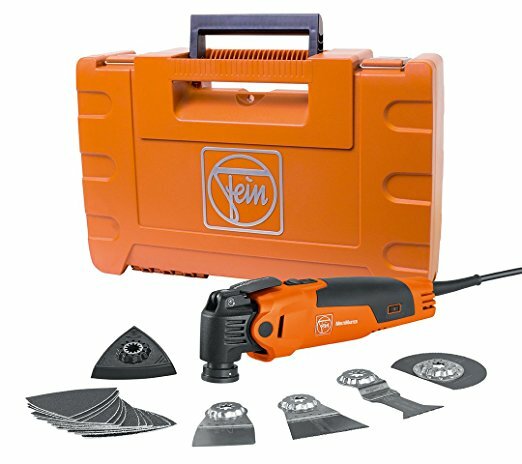 The Fein FMM350QSL is a cost-effective machine. It works efficiently, safely and with lots of ease, and is, therefore, an ideal choice for extreme DIYers and professionals. Its compatibility with a wide range of accessories, including those from rival brands, plus the fact that it incorporates the StarLock mounting system allows that it operates with an abundance of power, minimal noise, and vibration. And you don't have to use any pins or tools to change the accessories, which saves you both time and effort. You can use the manufacturer provided carrying bag for storing all the different accessories so that there is minimal or remote possibility of losing or misplacing them. In all, the FMM350QSL is one of the best oscillating tools on the market. It features heavy-duty, rugged construction and has a commanding presence in the hand. Nevertheless, the oscillating tool is lightweight and compact and comes with a high-performance and durable motor that provides for quick, efficient, and flawless operation. It works quietly and with minimal vibrations. And jumping between cutting, sanding, sawing, and grouting is considerably easy with the inclusion of a pin-less, tool-free quick change technology. As far as performance goes, the Fein FMM350QSL is a tough deal to beat. Performance is a general term, but it generally entails both speed and power, considering that you can’t attain higher speeds if your oscillating tool doesn’t have power. For light-duty to medium-duty applications, an oscillating tool with a range of between 2-amp and 3-amp motor should more than suffice for the vast majority of domestic applications. For contractors, handymen, carpenters and other professionals, one with more than 3-amps of power would be ideal as it suppliers the requisite power for quickly, effortlessly, and quickly completing the toughest projects around the job site. With immense power, it should not be difficult to attain speeds of up to 20,000 oscillations per minute. If on the other hand, you have to complete some precision work, then look for a machine with a variable speed feature that allows you to match the speed to the task at hand effortlessly. Without a doubt, slower speeds will be more than ideal for projects that require more accuracy. If would beat the purpose of buying a powerful and fast performing oscillating tool if it takes great effort and lots of time getting it to work. To this end, ensure your machine features an ergonomic design, which is to say that the handle grips should be comfortable enough to provide for extensive use. Secondly, a lightweight and compact design doesn’t put any unnecessary pressure on the hands and does not lead to hand fatigue, which is important for when you have to work for several hours on end. Also, if it’s lightweight and comes with an impressive oscillating angle, it should be easy to make clean, precise cuts in even the tightest or hard-to-reach spots. Speaking of reach, the oscillating tool needs to be portable. Battery-powered models come with incredible portability as you don’t have to drag a long, heavy power cord with you wherever you go. Electric models spectacularly fail in this regard. They have heavy cords that not only limit your reach but also are a pain to drag from one place to another. Sanding, sawing, grouting, and cutting are involving and rigorous tasks that inevitably cause the oscillating tools to vibrate vigorously and produce, in some instances, ear-splitting noise. You can circumvent or prevent the impending health complications by donning the right gear such as ear protecting plugs and shock-absorbing gloves or you could just get an oscillating tool with vibration dampening ball-bearings and one that operates quietly. Unlike brushed motors, brushless motors are renowned for their significantly longer runtime, flawless and quiet operation, and minimal vibrations. Oscillating tools are either battery-powered or electric, and the two designs have their respective upsides and downsides. To begin with corded oscillating tools, they are marginally more powerful than their battery-powered models and save you the frustration of having to constantly check the battery status and wait for the battery to charge before embarking on any project fully. And since they use batteries, they are significantly lighter and more compact. The only notable downside is the power cable. Some are heavy and most of the time will get entangled between different objects and limit your movement. Battery-powered oscillating tools, on the other hand, are eco-friendly and very portable. Provided the battery has a full charge, you can go as far away from the house as possible. Q: How do I best maintain my oscillating tool? A: An oscillating tool is a largely simple and modest machine that demands very little in the way of maintenance. You’ll only have to watch out for sawdust and debris as these could easily reach the internal components and internal with the optimal functioning of the machine. Similarly, the oscillating machine needs to good blades that are in good condition. Also, make a point of keeping the machine away from water and other corrosive agents. Q: What is the difference between a rotary and oscillating tool? A: While both spin different accessories at high speeds and can be used to undertake the same projects, a rotary tool is capable of both forward and backward rotation, a fete an oscillating tool can’t emulate. And while a rotary tool accords the user greater precision, it lacks the power and speed of an oscillating tool. The market has several oscillating tools, coming in different sizes, types and performance levels. However urgently you want an oscillating, we’d highly advise against settling for a cheap alternative as you’ll be missing on several time-saving, convenience, and performance features. Some oscillating tools might command a higher price, but they have all the bells and whistles to withstand rigorous tasks like scraping, sanding, cutting, and grouting, among others. Rugged and sturdy oscillating tools can easily be pushed to the limits without any significant wear and tear. Luckily, our list features some of the best oscillating tools on the market. They are cost-effective, easy to use, affordable, versatile, and durable. We hope you settle on the right one that best meets your unique requirements.